Moving overseas can be very challenging. This is especially true when you are not living alone. With international health insurance at hand, adequately preparing your children of all ages before relocation is very important and it will assist your family with the best start to a new life abroad. The following tips provide information on how to deal with different age groups when moving overseas with children. For most parents, if you are moving overseas with children under Grade 6 to a country where English is not the official language, don’t worry. Scientists have already proved that the age group between toddlers and Grade 6 can learn a new language fast with ease. Also, it is believed that this age group of children adopt new environment much more quickly. For children between age 9 and 12, however, make sure that you provide with them more details about the move overseas. They may already have many friends at school. Living abroad may seem taking away from everything they love in their home country. Spending more time with your children and encouraging them to keep in touch with their friends either through the social media sites and over the phone. Involving them when discussing life overseas, as well as enrolling them in some clubs with activities that they showed interest in. Teenagers are likely to think of themselves as young adults. Moving overseas with teenagers can be more challenging if you didn’t have a good chat with them. Most expat families want teenagers to help with preparing and organizing when living abroad. At this age, although they are not sure about leaving, plus they already have a strong tie with friends and social networking, children in this age group will generally have the maturity to recognize that they will have many more opportunities abroad. However, relocating to a new country can be found more difficult for this age group due to the language barrier at the beginning, culture shock and extending social networking. As expat parents, you should continually focus on the positive aspect of the whole process and be patient about their doubts, questions and even give up. Talk to them about their expectations, try to work together to solve the challenges they are facing as a whole family, and consult educational opportunities available that they will be able to take part in. It is a great adventure for children of this age. One of the most daunting aspects of moving abroad with children is finding adequate schooling for your children young and old. Amongst all choices available, local schools and international schools are the two most popular options for many expat parents. The majority of local schools are teaching in their local language. For children coming from English language environment, this could be challenging at the very beginning. But if expat families are planning to stay permanently overseas, it is always better to encourage children to grasp the local language by attending local schools, especially of primary school age. The international schools, however, usually teaching in English language or has English as their second language. It is more costly than local schools, but expats may find it easier for their children to settle in. Some international schools provide world-recognized education curricula, such as Montessori methodology, IB program(International Baccalaureate) and AP (Advanced Placement). It will help if expat children want to continue their home country education when living abroad. International health insurance coverage is a necessity and should be your top considerations except for children. 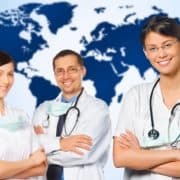 Expat Financial offers a wide range of expatriate health insurance plans designed specifically for any expatriates of any nationality around much of the world. Our expat health insurance plans can also cover local nationals where conditions permit. It is crucial for every expat family to take the necessary action to ensure that their spouse and children’s health and well-being are protected and provided for via an appropriate level of expat insurance. If you have questions about our international medical insurance plans or if you want to discuss your needs and produce a customized evacuation quote, please contact us or complete the quote form.